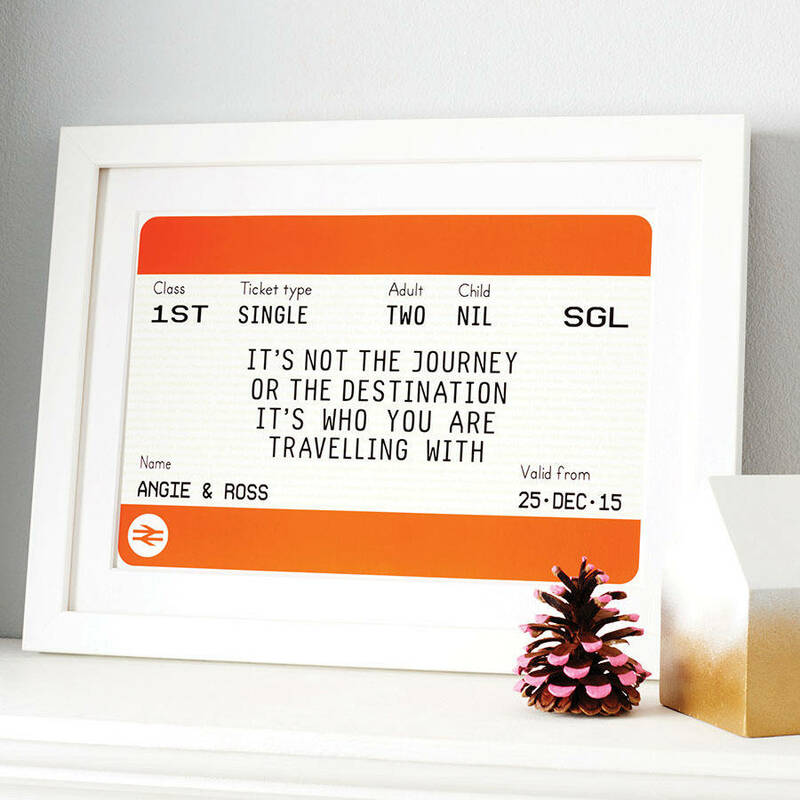 This personalised train ticket print would make the perfect personalised wedding gift or anniversary present, with its romantic quote about our journey through life. 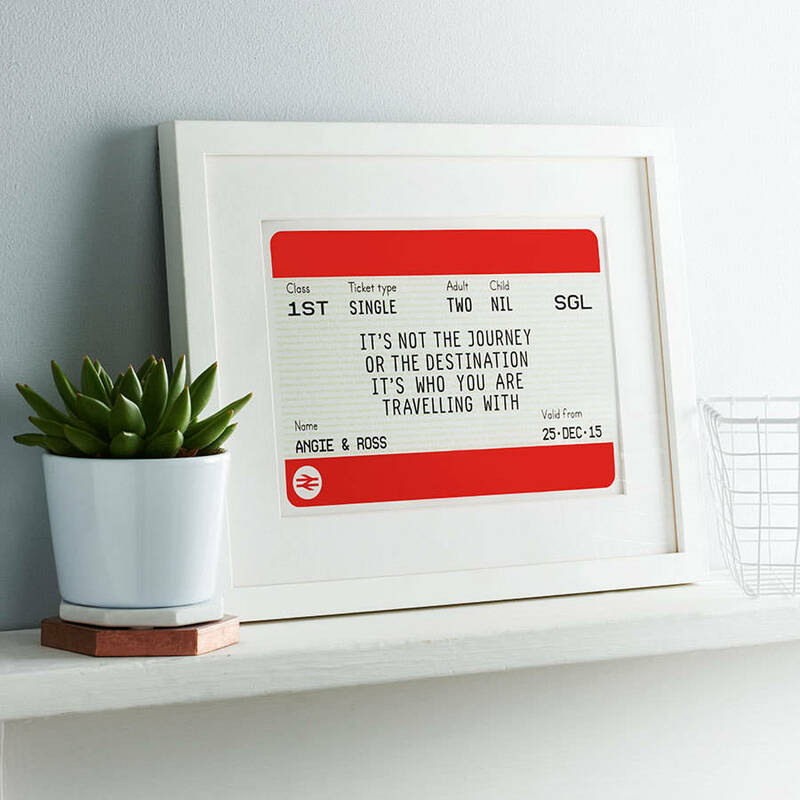 This charming personalised train ticket print features the instantly recognisable image of a British Rail train ticket which can be customised to your requirements. 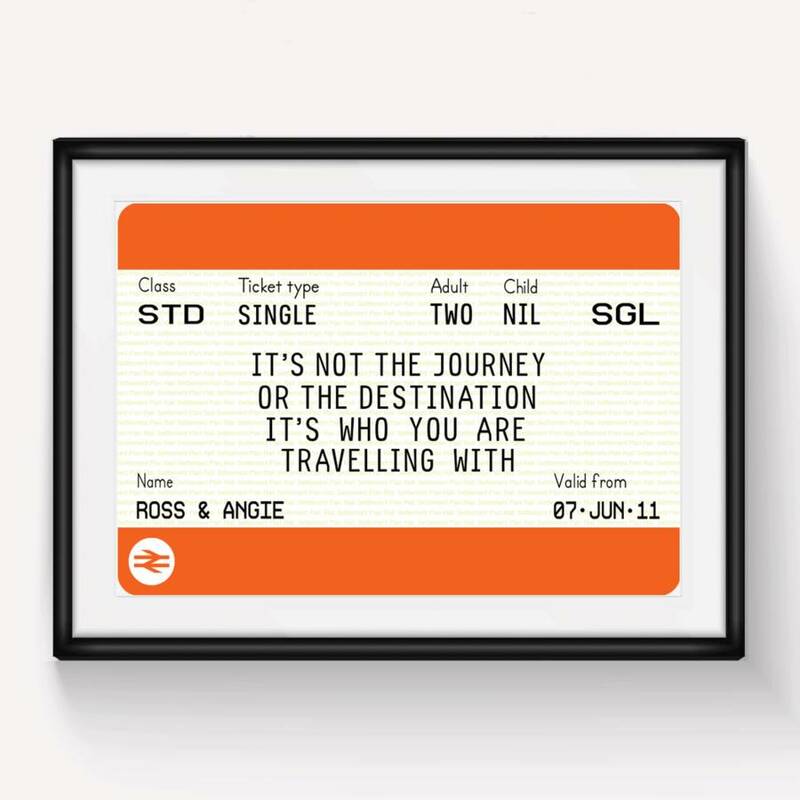 The personalised print makes an ideal wedding gift or anniversary present as its romantic quote perfectly describes the beauty of married life. 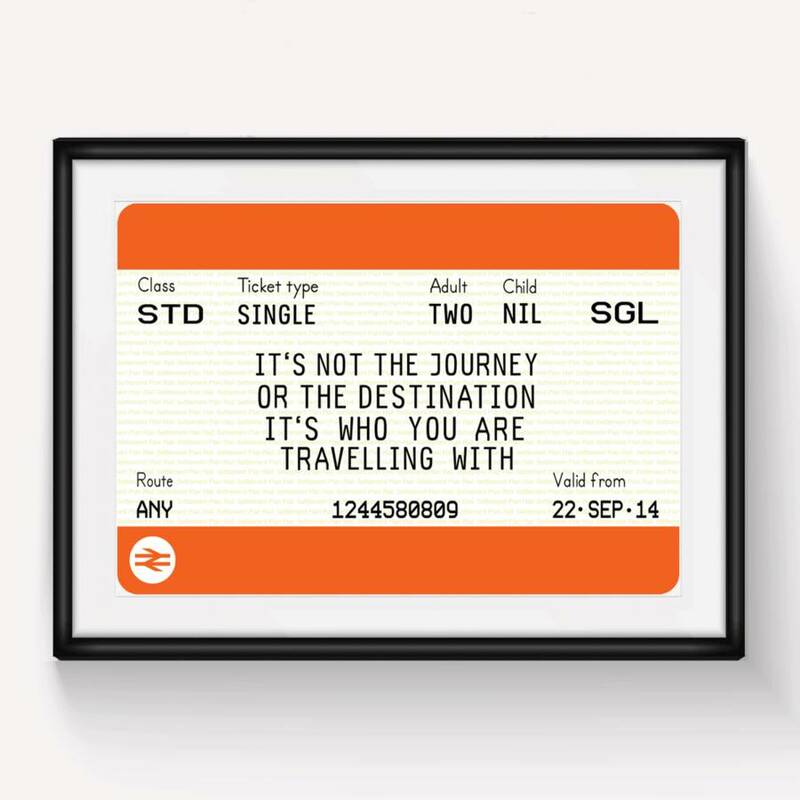 With the personalisation option you have the chance to make this wedding print an extra special gift. 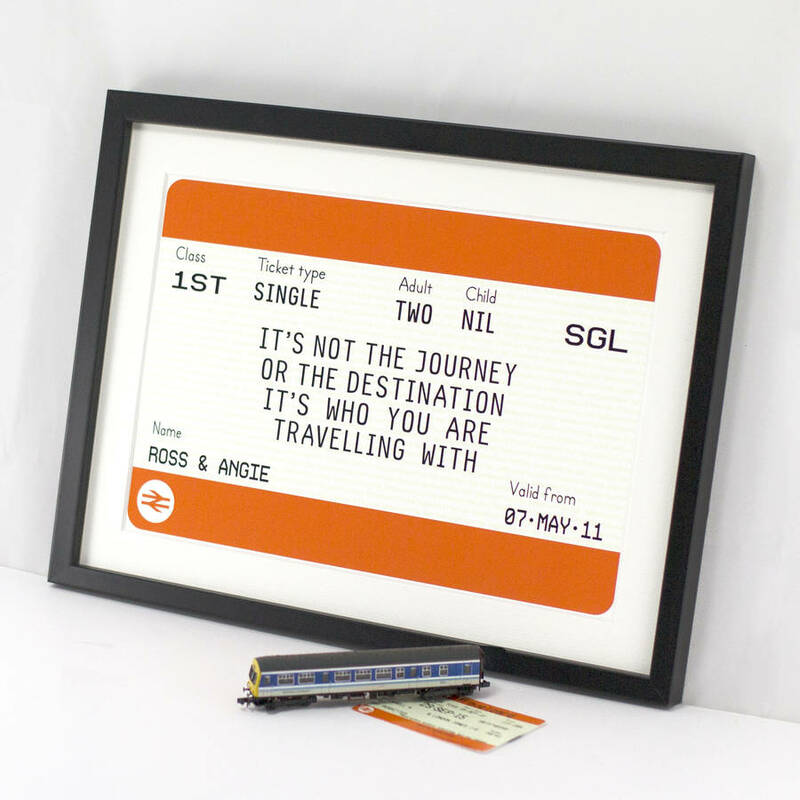 The quote can apply to so many occasions such as weddings and anniversaries, but its travel theme also makes it an ideal leaving gift for someone about to embark on an adventure. 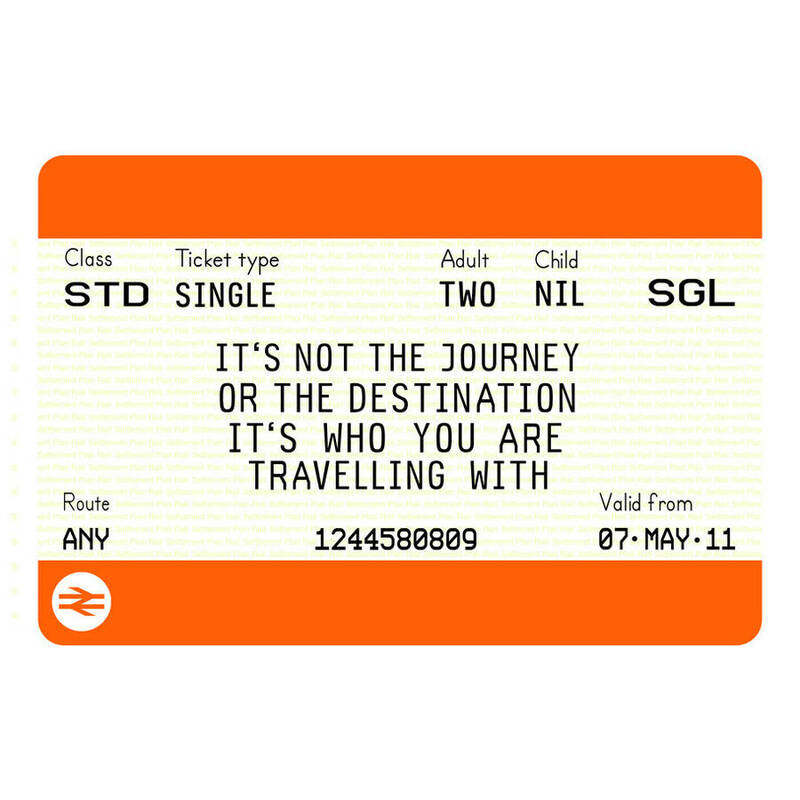 Please note this print is an official National Rail product and the train ticket likeness and National Rail logo has been produced under license. Due to this a royalty fee has to be paid on each print sold and therefore comes at a slightly higher price point than my other prints. The name and date sections of this personalised print can be tailored to your needs so why not add the names and date of a happy couple's wedding? 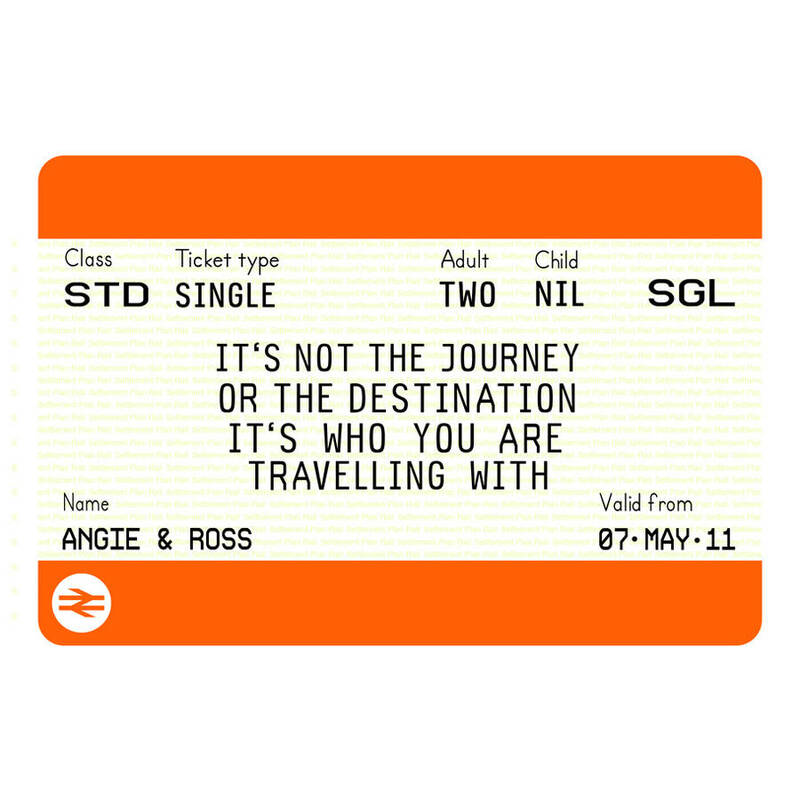 Or the name and date of someone's departure as they leave on their travels. Or an anniversary gift, Valentine's present - the list of occasions is endless. The number of adults and children can also be amended to include the number of people within the recipient's family. Please write your personalised details carefully as I will copy exactly what is written. If you would like the quote in the middle changed please select 'yes please' and write your new quote in the box. Please note all tickets come as 1st Class now - pics to be updated. If you would like a standard, unpersonalised version of this print then please enter 'no name' in the first box and you will receive the version pictured in the first image. A4 - The image is printed on crisp, Archival 210gsm Décor poster paper which is naturally white with a slight texture, using HD ink for an exceptional print quality. The print fits any standard, off the shelf frame or mount with an A4 (21 x 29.7cm) aperture and are sent cellophane wrapped with a cardboard backing to keep them flat. A3/A2/ Giclee prints - the larger size prints are printed on a premium 270gsm paper using top of the range HP printers. The specialist paper has a matt-coating with an off-white shade and a smooth surface texture. The matt coating guarantees brilliant colours and a sharp resolution. The train ticket print can be framed and mounted in your choice of black or white frame. The real wood frames have a smooth finish with no grain visible and come with high quality acrylic safety glazing. The frames provide the perfect finish and come complete with a precision cut mount and D rings with cord for displaying. The frames are supplied and prepared by specialist framers and members of the Fine Art Trade Guild.